ok i was driving home from dyno and thought it was a good idea to do an 4th gear wot. At 7300 i was cut by lean prot. and out of a sudden i heared a rattling noise from the front of the engine. today i found that the s/c compressor wheel wiggles around and has lots of play. C38-81 is fitted only 2 mounth and only 4-5k miles. anyone knows what is causing this? From the datalog i can see that at 7300rpm the boost does down immediately while i'm still on full throttle and then lean prot. cuts the engine because it was in n/a region. revlimit was set at 7700. I'm running an Ep3 k24 with tts bottom Mount kit. Looks to very much be a manufacture fault on the shaft that has caused an imbalance and then a component failure. Just contact tts if that's where you brought the supercharger as well and it will get sent to rotrex for warranty claim. thx. bought it from komotec germany which is the distributor over here. Last edited by rsamd; 09-08-2013 at 06:42 PM. As you are running a K24 are you running a K24 crank pulley? What dia supercharger pulley are you running. it was with k24a2 148mm cp and 95mm bp and a 7700rpm limit. That's on the money. Do you have a power curve you could show me? Is ROTREX going to Warrantee it..?? If instead of looking for the max bhp which will always be at the limiter, its better to sacrifice a little at the top end and nose over the power so you feel when to change up a gear. This will stop you hammering into the rev limiter. These engine rev so fast in the low gears its almost impossible to hook the next gear without hitting the limiter, nosing over the power and giving you a warning will mean faster acceleration as you will change gear at the right time and in the process be a bit more sympathetic to the supercharger. A turbo makes its power much earlier then goes flat at the top end and you know its time to change, with the supercharger you need the same feeling. I think all Rotrex superchargers should be set up this way, there is no point in having peak power on the limiter, you can't use it. 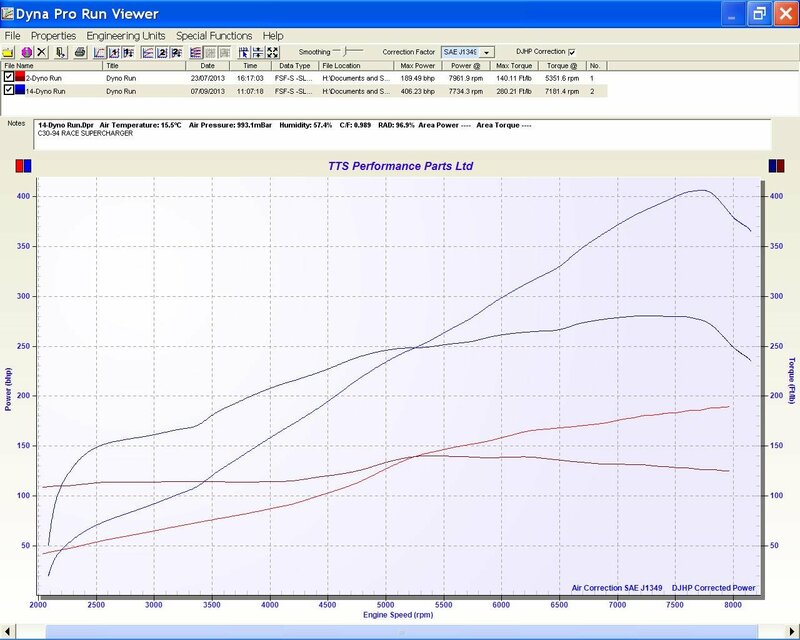 Rev limit aside, doesn't his power curve look very similar to yours (peaking around 7700rpm)? Are you suggesting that he simply raise the rev limiter to keep from bouncing off of it? i would say if you hit the limiter all the time you don't know how to drive. i usually shift at 7500-7600. I was driving home 2hours and never hit the limiter till it snapped. i'm running a forge 007p bov as i want it as quiet as possible when cruising down the road. mabe i add my tial q 50mm for savety if its nessessary. but its loud as f'''' on a rotrex. Agreed on the rev limiter point. I'm just trying to better understand his position. Anyways, good luck with the warranty. The lack of serviceability of the rotrex scares me. Last edited by SupNinj4; 09-09-2013 at 03:45 PM. The example is a 2 litre so revving higher, it's just the curve I was showing. Do you have standard 2 litre gearing? The car as standard is stupidly low geared and cruising in Germany is probably moving along a bit you could do with a 50% overdrive. 6th. With all your power. We have high power civic's here and they are not right for everyday use. It just seems all wrong to scream it at 6000plus rpm for hours. I'm sure you know where I'm coming from. But if its your only mode of transport you have to do what you have to do. It doesn't excuse it breaking. Send it back to Komo tec and go from there. Not a problem. If you are a Rotrex customer of TTS's then we will supply you a new unit at 50% discount on an none warranted failure. This would probably be cheaper than a rebuild. But on public roads at 65mph in 6th its like driving through a River with the tial q bov. I think the rotrex units are great and most customers run them without issues. But people dont post in forums if they run without issues. you know. So on these c38s they self destruct if you hit the limiter? What about launch control limiter? Was talking to someone that said a guy broke 3 c38s until he stopped hitting the limiter. (They increased the limiter and shifted before it) my worry is during wheel spin hitting the limiter or what about VSA kicking in? I'm not an expert for materials but look where it broke. there's a dark grey area in the middle that goes half way through the cut. shouldn't this be shiny pure metal?! looks like some metal impurities in the shaft. and i think if somthing breaks it should be the impeller with its thin blades, not the ~10mm billet shaft. Last edited by rsamd; 09-13-2013 at 05:57 AM.